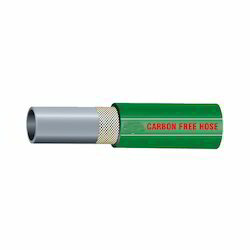 Pioneers in the industry, we offer carbon free hose from India. Our reputation in the market is largely attributable to our precision-designed Carbon Free Hose from our extensive collection of products. It is used for protection from exposure to high temperature, current leakage, radiation from steel furnace, open flame and splashes of hot metal. This hose is manufactured using excellent quality raw-material and the latest technology by our skilled professionals. In order to ensure quality, offered hose is strictly tested on various parameters by our experts. Apart from this, remarkable quality and sturdy structure increase the demand of our offered hose in the market. Lining Smooth, non conductive, natural/ synthetic/blend rubber compound. Reinforcement Natural/synthetic rubberized woven textile fabric.